Peppermint—the word conjures up images of bubble gums, right? But, peppermint is also used to provide flavor to various other products. Some of them are toothpaste and tea. It is an active ingredient in various medicinal and cosmetic products. Peppermint plants are generally found in Europe and Asia. Some species also grow in Australia, South Africa and South America. The plant blooms from July till August. The leaves of this flavorful plant are dark green in color. Peppermint tea is an amazing way to enjoy the medicinal properties of peppermint. It is caffeine- free and is known for its healing properties. The tea is prepared from dried leaves of the peppermint plant. It boosts the immune system and also lowers stress and fatigue. But, there are some surprising peppermint tea effects that can be harmful. Individuals suffering from indigestion problem should consult their doctor before consuming peppermint tea. It might interfere with the indigestion medication and cause further side effects. Peppermint tea also lowers the blood sugar level in the body. This tea might also interact with your diabetic drugs. So, individuals who are diabetic should avoid this tea or take it after consulting their doctor. Side effects of peppermint tea can also result in developing allergic reactions. Headache, unsteady feet and mouth sores are some of the symptoms of peppermint allergy. When you notice such symptoms, avoid taking the tea or consult a doctor. Those with Hiatal Hernia or Gastro Esophageal Reflux Disease (GERD) should avoid peppermint tea. While some people get relief from GERD symptoms, others report worsening of their symptoms with the use of peppermint tea. Peppermint relaxes the sphincter, but it also allows the stomach acids to return back into the esophagus. Peppermint oil has emmenagogue effects, which means that it might stimulate uterine blood flow and put pregnancy at risk. Though peppermint tea contains less amount of peppermint, it is better to avoid peppermint tea or consult your doctor before consuming a cup. Pregnant and lactating women should stay away from peppermint in all its forms to be safe. Peppermint tea is considered to be very strong for small children and babies. It might cause breathing difficulties and burning sensation in the mouth. It is better to consult your doctor before giving it to your infants and children. No matter the temptation, avoid giving even small doses of peppermint tea to your child. Peppermint tea also interferes with some specific medications. Drugs taken for stomach acid, blood pressure, cyclosporine and diabetes, interact with peppermint tea and cause side effects. So, if you are on medication for any of these health issues, say no to peppermint tea. The Food and Drug Administration (FDA) does not give license for the production of herbal supplements and tea. So there is no guarantee that the peppermint tea you are consuming is free from contamination. One of the major side effects of peppermint tea include serious stomach disorders. 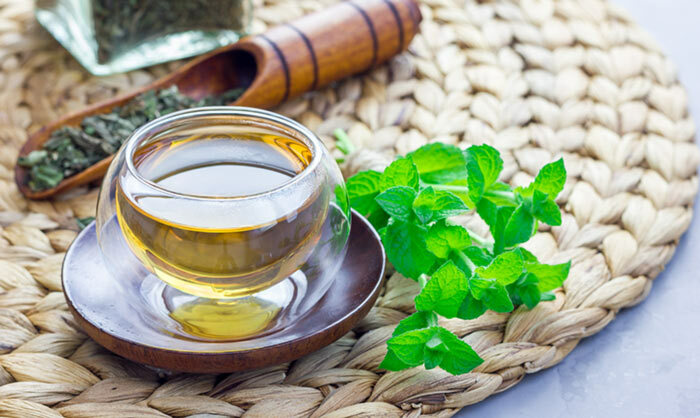 Diarrhea, muscle pain, cramping, drowsiness, tremors and drop in heart rate are some of the side effects of the over consumption of peppermint tea. Here comes a serious side effect of peppermint tea! Many doctors advise people with stomach ulcers to avoid peppermint tea. It is important to avoid it especially because it contains menthol, which can aggravate the ulcer and cause further damage.